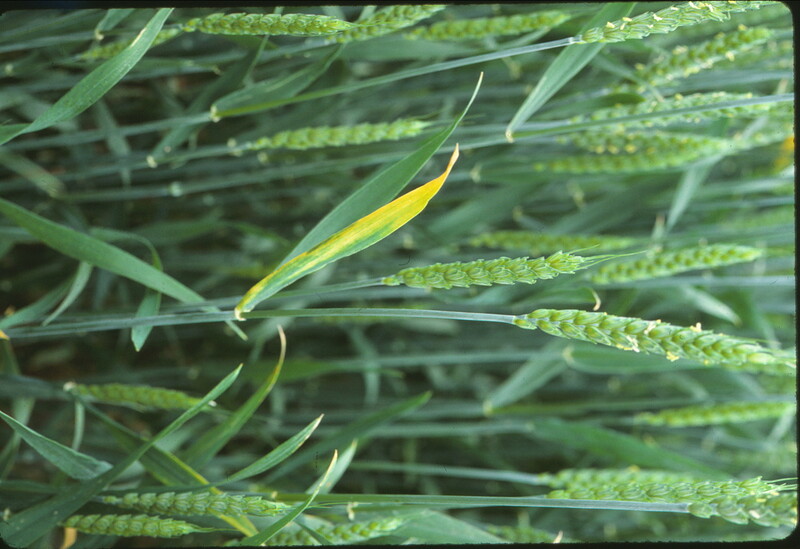 The fungus that causes Cephalosporium stripe (Cephalosporium gramineum) infects wheat below ground in fall and winter. This results in stunting and dead standing stems called white heads. 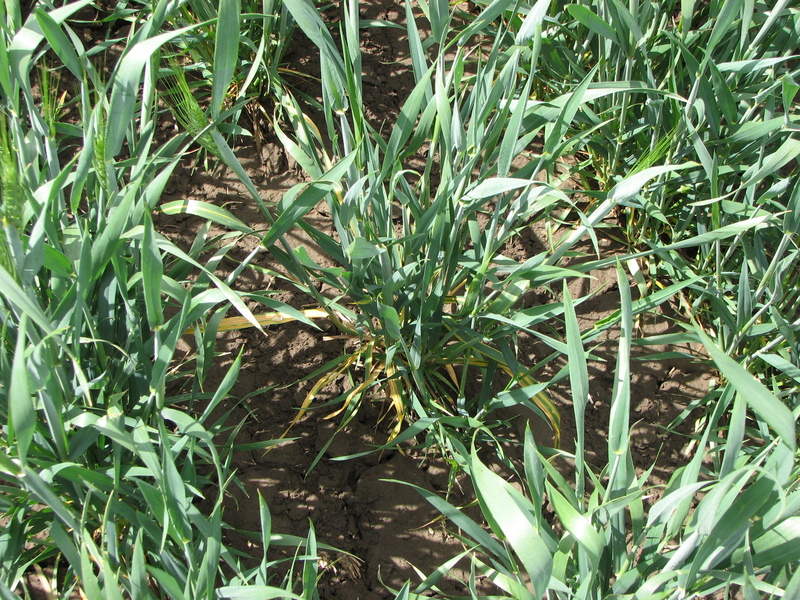 Early symptoms include a chlorotic mottle appearing as the plant breaks dormancy in spring. 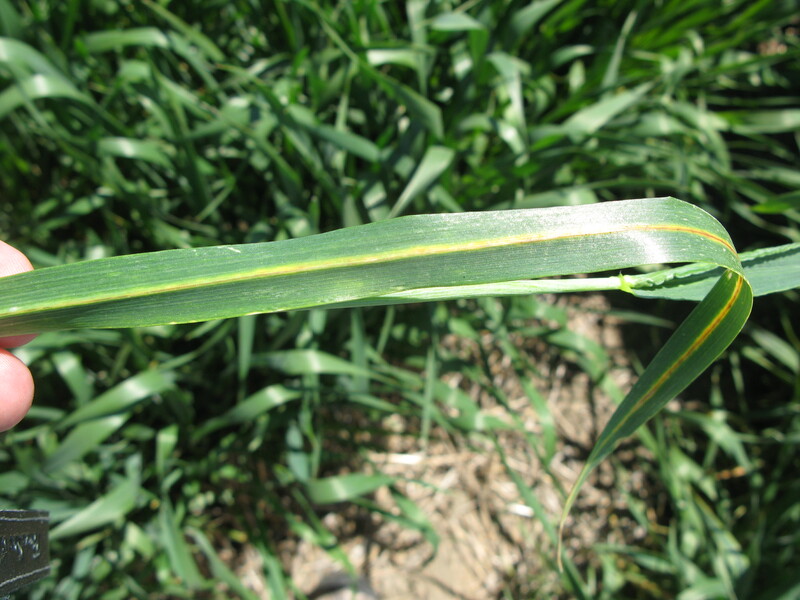 As the plant matures, one to three distinct, yellow stripes appear near leaf veins. Stripes develop on lowest leaves first, and advance from the leaf tip towards the leaf sheath on the stem. Eventually, thin brown streaks appear in the stripes. Orange-brown discoloration is evident inside the stem and nodes are dark colored. Severely infected stems become bleached and heads die, containing only shriveled grain. 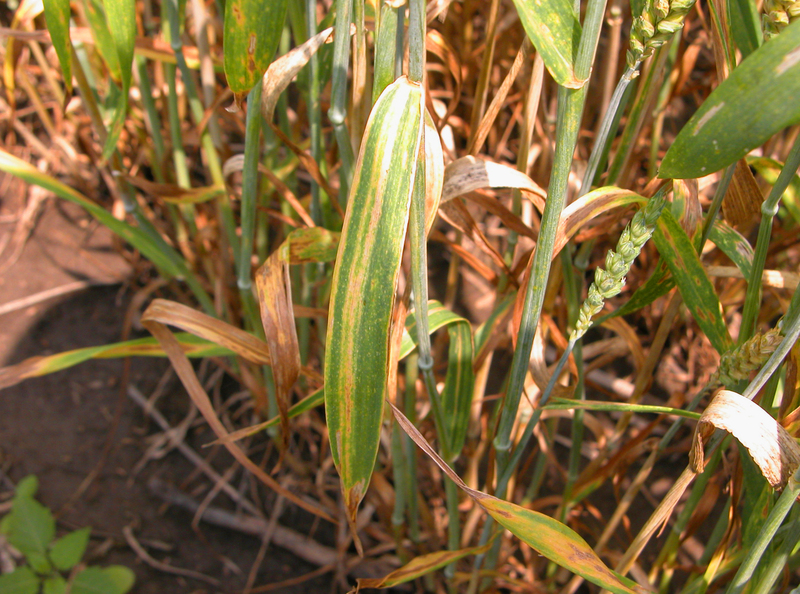 Symptoms can be present from tillering stages through ripening. Cephalosporium stripe will not have powdery spores in the stripe as does stripe rust, and discoloration will be present in vascular tissue. 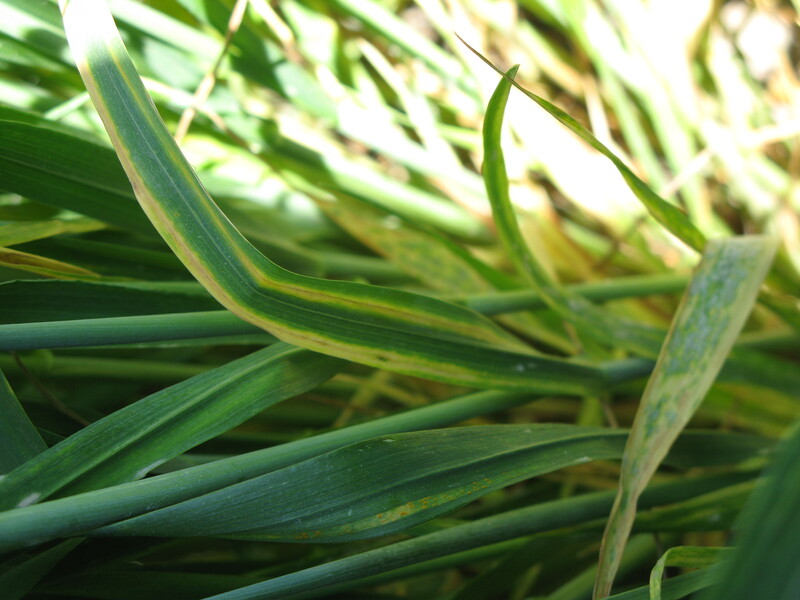 Cephalosporium stripe appears as one to three distinct, yellow stripes appear near leaf veins. Image: C. Grau. 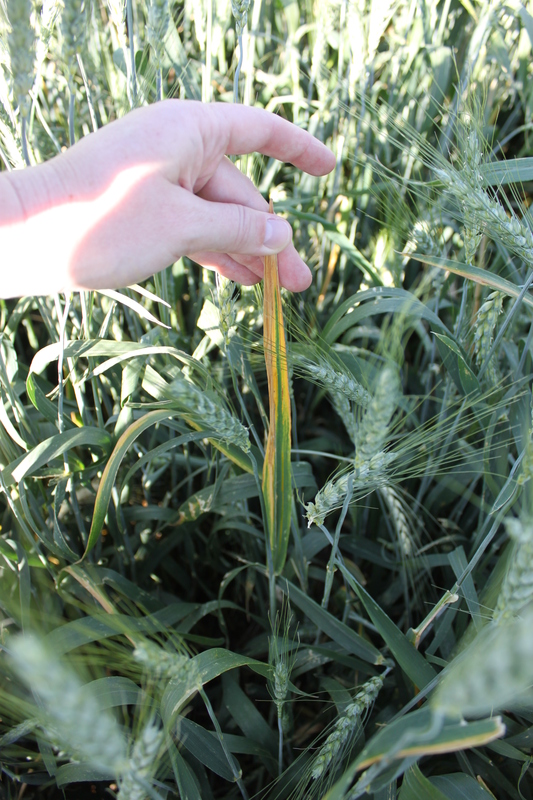 Cephalosporium strip symptoms on wheat foliar tissue. Image: C. Grau. The causal fungus survives in wheat residue. Infection is more likely in wet, low lying areas, as well as in acidic soils. High levels of residue, short crop rotations, and planting early favor disease development. Climates where winter temperatures remain around 32°F are preferred by the fungus. Fields with a history of Cephalosporium stripe should be planted with a tolerant variety. Where disease has been severe, choose a variety with moderate resistance and plant one to two weeks later than normal in the fall. Encouraging residue decomposition and rotating to a non-host crop (non-winter cereal crop) for up to three years can reduce inoculum. As the plant matures, one to three distinct, yellow stripes appear near leaf veins. 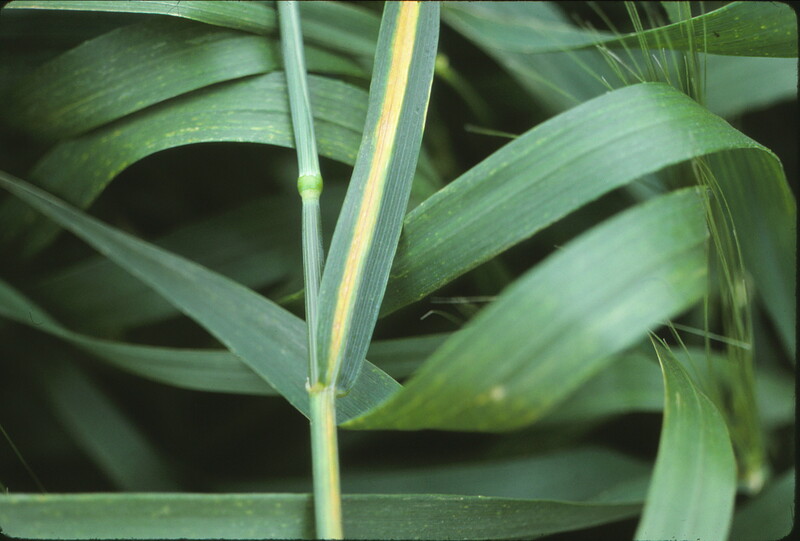 Foliar symptoms of Cephalosporium stripe. Stripes develop on lowest leaves first, advancing from the leaf tip towards the sheath. Stripes develop on lowest leaves first.